Do not connect, disconnect, or operate the USB device while driving. Doing so can be a distraction. If distracted you could lose control of your vehicle and cause an accident or serious injury. The USB input jack is located in the center console. Insert the USB device into the jack 1 . When a compatible storage device is plugged into the jack, compatible audio files on the storage device can be played through the vehicle’s audio system. Place the ignition switch in the ON or ACC position and press the AUX button to switch to the USB input mode. If another audio source is playing and a USB memory device is inserted, press the AUX button until the center display changes to the USB memory mode. If the system has been turned off while the USB memory was playing, push the ON-OFF/VOL control knob to restart the USB memory. Information about the audio files being played is shown on the display screen of the vehicle’s audio system. Touch “Browse” to display the list of categories that can be used to narrow the search. Touch the name of a song on the screen to begin playing that song. button several times to skip backward several tracks. file on the USB device is playing to advance one track. skip forward several tracks. If the last track in a folder on the USB device is skipped, the first track of the next folder is played. While files on a USB device are playing, the play pattern can be altered so that songs are repeated or played randomly. Touch the “Random” key to apply a random play pattern to the USB device. To cancel Random mode, touch the “Random” key again. 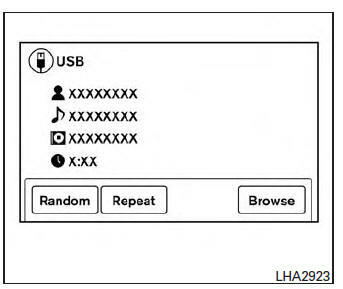 Touch the “Repeat” key to apply a repeat play pattern to the USB device. To cancel Repeat mode, touch the “Repeat” key again.